Italian champions Juventus have completed the signing of Shanghai Shenhua striker Nicolas Anelka on an initial six-month contract. Anelka, 33, passed a series of medical tests in Turin last week but the deal - which includes an option for a further year - has only now been concluded. "It's nice to get back to a big club," the well-travelled player said. "I'm proud to put on the shirt." 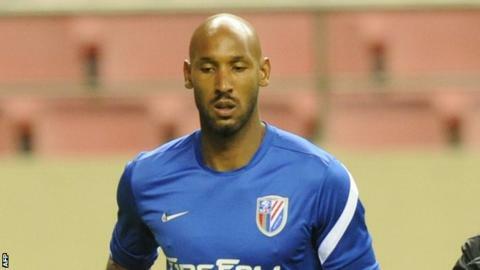 Anelka, who left Chelsea for China in 2011, had been linked with QPR. The move sees the former France international depart after an underwhelming spell during which he scored only three goals in 22 games as Shenhua finished ninth in the 16-team Chinese Super League. Anelka - who also counts Arsenal, Real Madrid, Paris Saint-Germain, Liverpool, Manchester City, Fenerbahce and Bolton among his former clubs - joins a Juventus side who are three points clear at the top of Serie A and face Scottish giants Celtic in the next round of the Champions League. "The Champions League is a very difficult competition to win, but a team like Juventus has the players and qualities needed and will do everything to win the cup," he said. "I know that Serie A is a very difficult, physical, hotly contested and very demanding league. I've never played in Italian football, the English style corresponds more to my style but I appreciate other leagues."